Fig. 1. 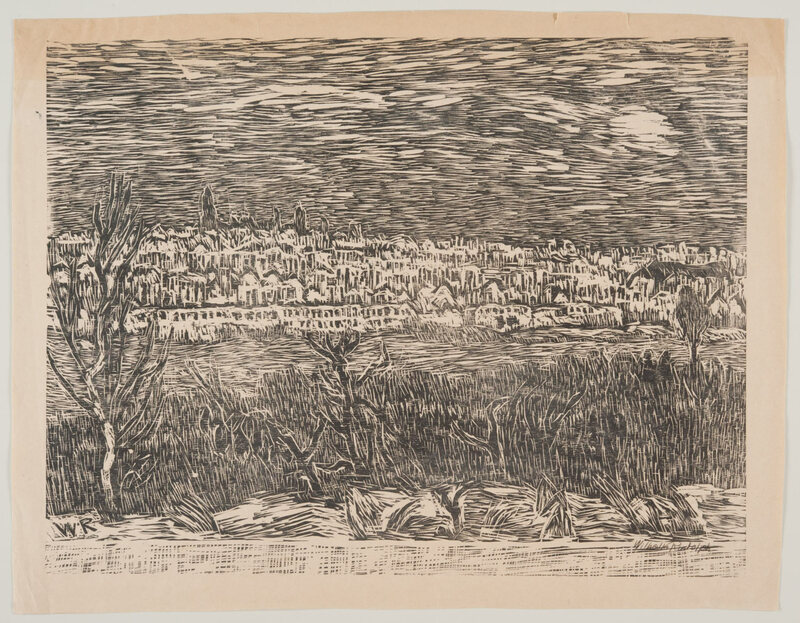 Wilhelm Rudolph, Ruinenstadt / Blick von der Südhöhe (1945–46), woodcut, 49.7 x 64.8 cm. Städtische Galerie Dresden. Photo: Franz Zadniček. 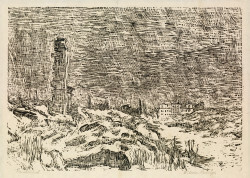 Rudolph’s earliest prints showed the influences of Jugendstil and Expressionism, but by the mid-1920s his persistent study of nature had fostered a more objective approach and his woodcuts took on their characteristic cutting style of short superimposed lines and hatchings; he seems to have used the gouges and chisels almost as freely as if they were drawing utensils. Through multiple diagonal overlaps he created fine, almost painterly effects, which enabled him to describe surface differences and spatial depths with great precision. He would work the entire surface—few areas are either fully black or fully white—with shallow incisions, avoiding the kind of deep cuts that might make the block difficult to print. Fig. 2. 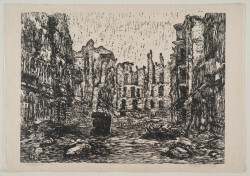 Wilhelm Rudolph, Mathildenstraße (1945–46), woodcut, 40 x 50 cm. Städtische Galerie Dresden. Photo: Franz Zadniček. Following regional representational traditions that dated back to the 19th century, Rudolph painted, drew and cut in wood that which he saw around him: human figures, animals in the zoo, Saxon landscapes and urban views of Dresden. 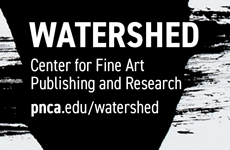 His choice of artistic means was determined by a radical struggle for autonomy. Rudolph almost never printed editions. In the lower left margin of his woodcuts, in place of an edition number, one usually finds the statement Handdruck (hand printed) or, more rarely, Selbstdruck (self-printed). Rudolph did not usually employ a press, instead hand rubbing his large-format prints with a bone folder, and producing just a few copies of each. 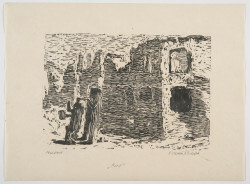 He frequently reworked the blocks after the first printing, so many of his prints exist in multiple states. In his graphic work, which he separated completely from his painting, he devoted himself to the strict discipline of the black and white woodcut. Despite the economic difficulties in Germany in the 1920s, Rudolph enjoyed increasing success as an artist. Museums in Chemnitz, Dresden and Berlin acquired his works; he was part of the leadership of the International Art Exhibition in Dresden in 1926 and in November 1932 he was appointed lecturer at the Dresden Art Academy. Three years later he was awarded the title of professor, but was fired in early 1939 after ongoing disputes with the school’s Nazi administration. Rudolph’s political biography is complicated and contradictory: during the Weimar Republic he briefly joined the Communist Party (KPD, 1923–25) and the National Socialist German Workers Party (NSDAP or Nazi Party, 1931–32), resigning from the latter when it proved to be less Socialist than he hoped. After the Nazis came to power in 1933, Rudolph attempted to rejoin the NSDAP, probably to protect his job, but was rebuffed. His position was tenuous: his work was included in the first “Entartete Kunst” (Degenerate Art) exhibition in Dresden in 1933, and in 1938 some of his works held by Dresden museums were confiscated as “degenerate.” He remained in Dresden throughout the war, working as a freelance artist. Fig. 3. 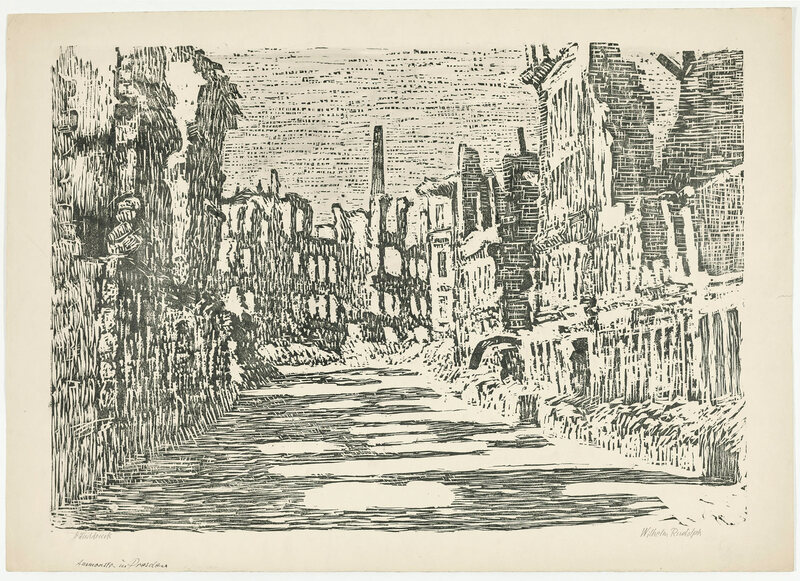 Wilhelm Rudolph, Zöllnerstraße (1945–46), woodcut, 48.7 x 65 cm. Städtische Galerie Dresden. Photo: Franz Zadniček. Fig. 4. 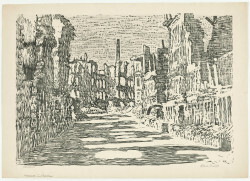 Wilhelm Rudolph, Zöllnerstraße (later state) (1945–56), woodcut, 48.7 x 65 cm. Städtische Galerie Dresden. Photo: Franz Zadniček. In the summer of 1945 Rudolph was able to obtain a room in the Academy of Arts, which had only partly been destroyed. His rent consisted of providing drawing lessons to the students who were restoring the building. It was there he first had the chance to make woodcuts of the ruins. Fig. 5. Wilhelm Rudolph, Mittagsangriff am 14. 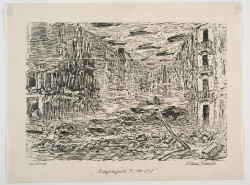 Februar [Midday Attack on 14 February], sheet 32 from the portfolio Aus (c. 1946–48), woodcut, 37.5 x 50.2 cm. Städtische Galerie Dresden. Photo: Franz Zadniček. 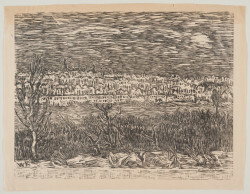 Among the earliest of these postwar prints is a complete view of the destroyed city taken from the southern slope of the Elbe Valley (Fig. 1) as well as a series of street views based on ​drawings he made on-site. 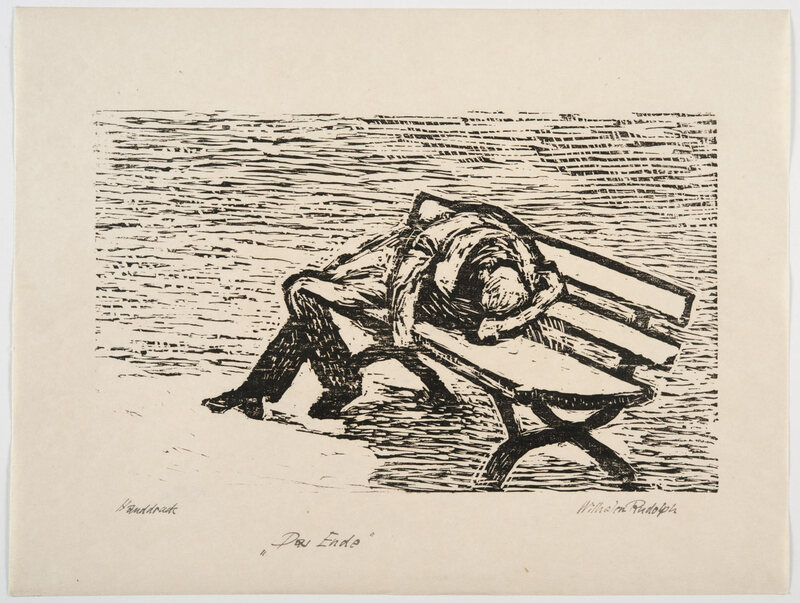 Compared to the drawings the woodcuts appear more dramatic, with stronger contrasts.9 Though Rudolph almost never dated his work, in 1945 he began using a new form of signature, which allows us to distinguish between his pre- and post-1945 work.10 The prints Mathildenstraße and Zöllnerstraße would have been made no later than 1946 (Figs. 2 and 3), after drawings completed before the end of the war. The black facades in these prints look as if the soot of the fires is still in the air. Debris and an overturned car lie in the streets. Everything is ghostly, as if suddenly abandoned. A later state of Zöllnerstraße gives an even more other-worldly impression than the initial version.11 (Fig. 4) The further cutting away of formerly black areas changes the mood, and the emptiness of the destroyed road is starker. 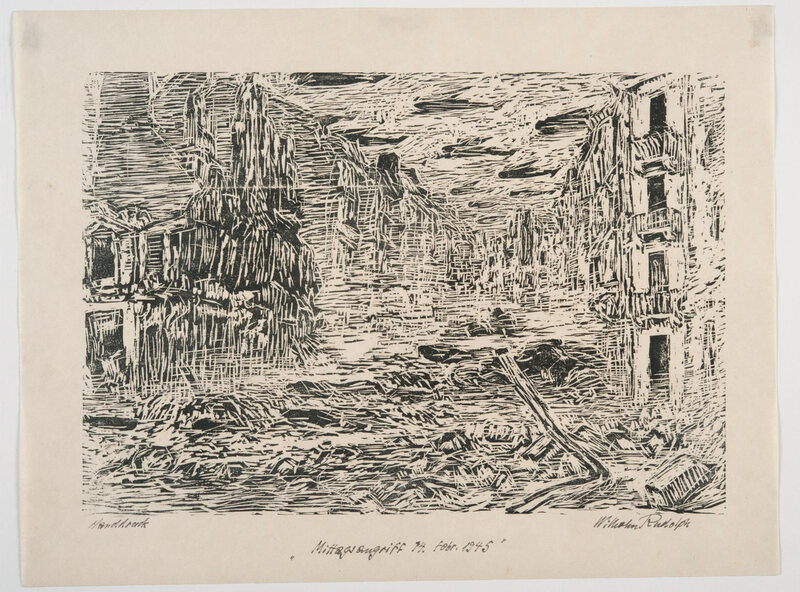 In the shadows of Rudolph’s famous drawings and woodcuts picturing the destruction of Dresden is a series of prints with the succinct title Aus.12 In it, Rudolph gives a poignant overview of life in 1945 in a wasteland of rubble. Beginning chronologically with Mittagsangriff am 14 Februar (Midday attack on 14 February) (Fig. 5), it covers the spectrum of chaos and human tragedy. The mountains of corpses collected in the Old Market Square and burned with flamethrowers, the columns of refugees fleeing the East, the bombed-out and war-wounded soldiers moving on crutches, animals being driven to the slaughter by the Red Army, a murder scene in the solitude of the rubble—all are included. (Fig. 6) In some only the title and the general context make the oppressive content clear. Motifs such as Das Ende (Fig. 7) contribute to the dark mood without making explicit the war-related causes of the situation. 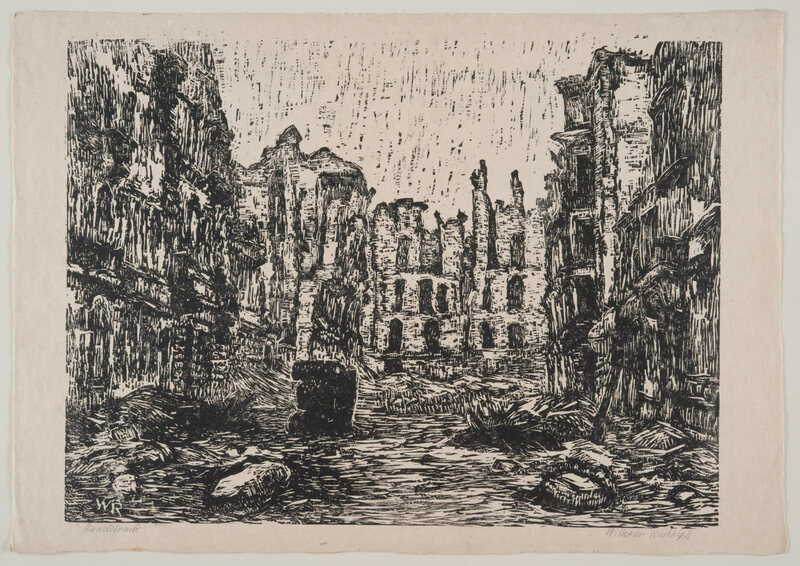 Twelve prints feature groups of ragged and wounded soldiers under the theme rubble of the Wehrmacht, eight are devoted to the misery of refugees, and ten others show again the vacant, destroyed streets of Dresden. In this series Rudolph participates to a larger extent in what is happening than in his other ruin images. Here he foregrounds people, marked by resignation, disorientation and hopelessness. It was undoubtedly crucial that this woodcut series was not undertaken in the service of official commemoration: Rudolph did not show the liberation—he described the defeat in all its facets. Fig. 6. 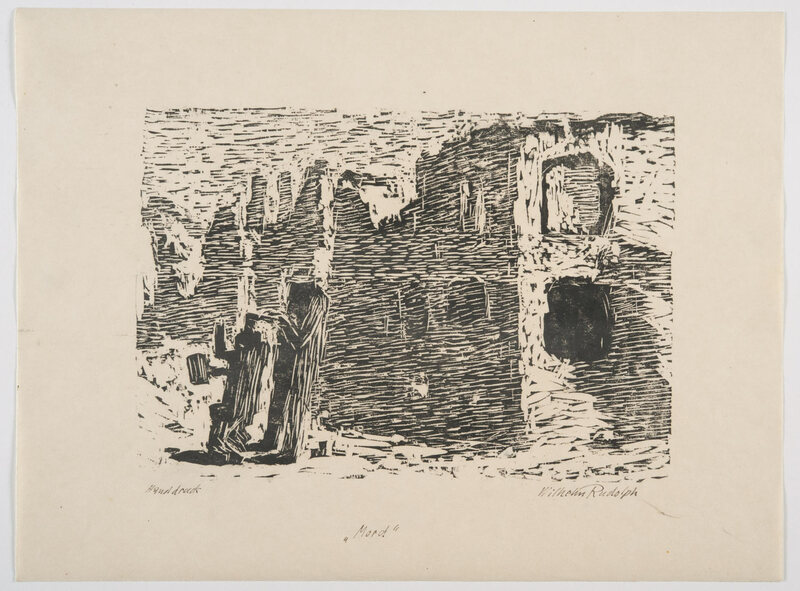 Wilhelm Rudolph, Mord [Murder], sheet 18 from the portfolio Aus (c. 1946–48), woodcut, 37.5 x 50.2 cm. Städtische Galerie Dresden. Photo: Franz Zadniček. In the years that followed, Rudolph could not free himself from this documentary task. 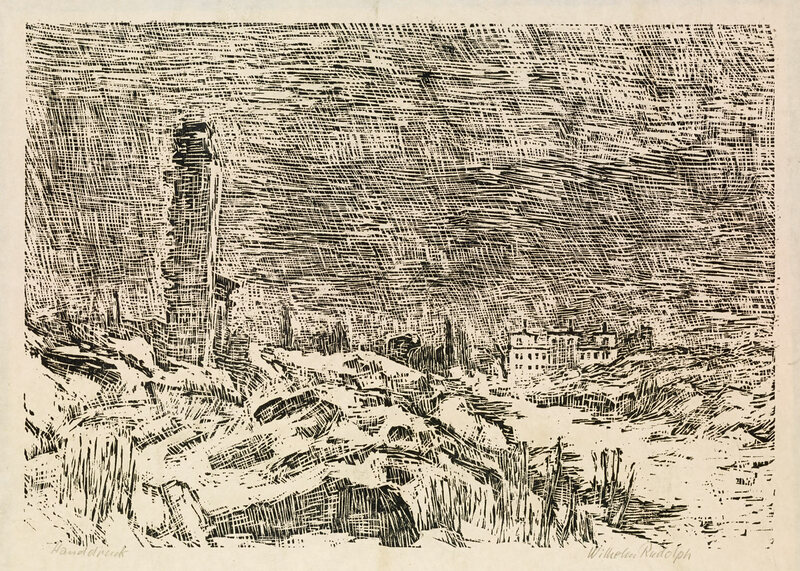 In prints, paintings and watercolors he continued to record meticulously the gradual changes in the rubble landscape. They show how first the main roads were cleared and how the rubble was piled along the roadsides (Fig. 8). Since strong winds repeatedly caused damaged facades to collapse, in the following years the remaining burned-out shells were intentionally razed. Piles of rubble overgrown with vegetation give the impression of a vast open landscape where isolated, less damaged or historically important buildings stick up like farmhouses in hilly terrain. The destruction was historical; people had grown accustomed to everyday life in the wasteland of rubble. For Rudolph, observing this transformation of the former urban environment recalled the Nazi propaganda reports about the never-executed Morgenthau Plan for postwar Germany, which sought to prevent any future German military threat by de-industrializing the nation and returning it to an agrarian state.13 In Dresden’s overgrown mounds of rubble, Rudolph saw just such a development. This is reflected in the macabre title Dresden as Landscape, which he gave to a series of about 200 watercolors made before 1949. These are supplemented by paintings14 and woodcuts, such as Am Fürstenplatz (Fig. 9). 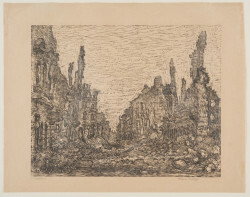 Rudolph’s black and white drawings and woodcuts are composed with austere, classical craftsmanship, but nonetheless convey the shock of shattered houses and destroyed streets where few signs of life remain. As Rudolph cut the woodcuts directly from his drawings, the prints are inevitably reversed left-right. 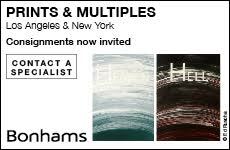 Clearly, he did not consider the recognition of the specific location to be critical, even in topographically verifiable subjects. Fig. 7. 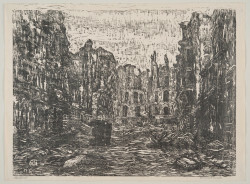 Wilhelm Rudolph, Das Ende [The End], sheet 3 from the portfolio Aus (c. 1946–48), woodcut, 37.5 x 50.2 cm, Städtische Galerie Dresden. Photo: Franz Zadniček. Fig. 8. 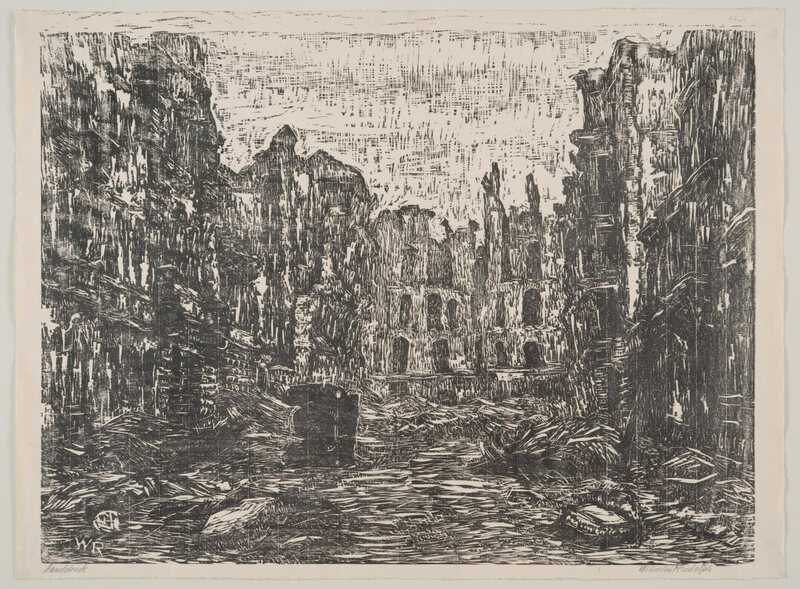 Wilhelm Rudolph, Ammonstraße (1946–47), woodcut, 43.6 x 61.8 cm. Kunstsammlungen Chemnitz. Photo Archive Prussian Cultural Heritage (bpk), László Tóth. 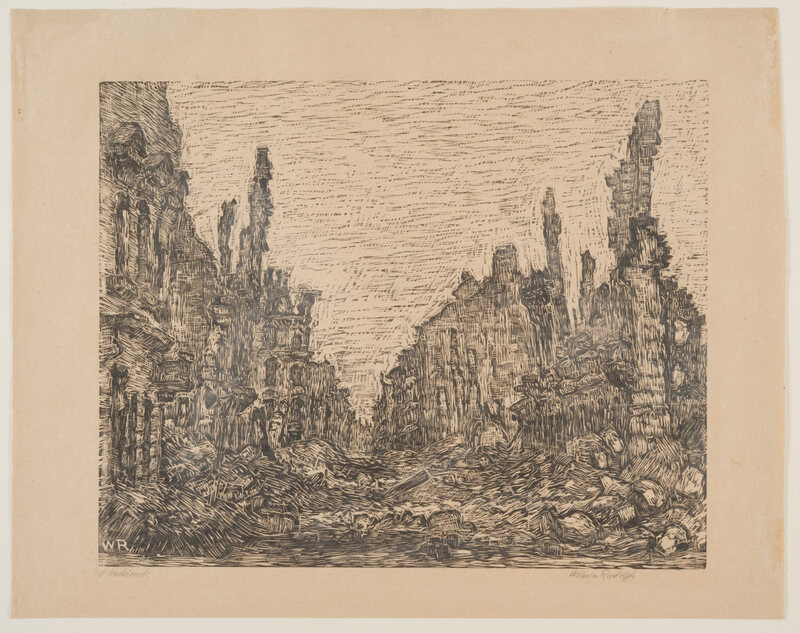 Today, a half-century after the event, Rudolph’s prints continue to shape the public memory of the destruction of Dresden and, more broadly, of the devastation of World War II. Examined individually they present concrete documents of specific streets that still exist; considered as a group, however, the seemingly endless succession of similar views approaches an abstraction. Rudolph clearly understood that much of the work’s impact was rooted in the pervasive repetition—the leveling effects of destruction, reducing difference and denying distinction. He refused to show these vast drawing and print series in anything but their entirety. Fig. 9. 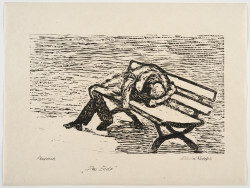 Wilhelm Rudolph, Am Fürstenplatz (c. 1950), woodcut, 35.8 x 50.8 cm. Staatliche Museen zu Berlin, Kupferstichkabinett. Photo Archive Prussian Cultural Heritage (bpk), Volker-H. Schneider. The message of these works is specific but not local: the ruins could be anywhere. They awaken not only the memory of destroyed Dresden but act as a memorial for bombed and shelled cities throughout Europe and beyond. Yes, they constitute a monument in the European history of art. But they also stand as archetypes of loss, unbound by time or geography.